The aim of the study is to analyze the characteristics of patients with rheumatic diseases applying for a Disability Certificate (DC). Every application for DC filed by patients of 16 years of age and older in the Health Secretariat of Junin, between 2012 and 2016, was analyzed regarding age, gender, rheumatic disease as the cause of disability, employment status, and health insurance coverage. Applications were examined as per two elements: inflammatory articular or systemic disease (IASD) versus degenerative diseases, regional or generalized pain syndromes (non-IASD). Based on the DCs accepted, a Disability Prevalence Rate (DPR) was estimated and the most common causes of disability were determined. Out of 400 applications, 68% belonged to women; applicants’ median age was 61 years, only 27% were working, 42% were for DC renewal, and 46% were IASD. Overall, 83% of the applications submitted were accepted. Those patients with accepted DC applications were older (median age 62 vs 55; p < 0.001), had health insurance coverage (90% vs 65%; p <0.001), were applying for DC renewal (49% vs 12%; p < 0.001) and more frequently presented a IASD (52% vs 17%; p < 0.001). 48% of accepted DC applications had osteoarthritis (OA), 36% rheumatoid arthritis (RA), 6% psoriatic arthritis (PsA), 5% systemic lupus erythematosus (SLE) and 2% ankylosing spondylitis (AS). The DPR was 0.5%. Overall, the accepted applications for DC belong to older patients with health insurance coverage, who were submitting an application for DC renewal and suffer from a IASD. OA, RA, PsA, SLE and AS were the five most common causes of disability. 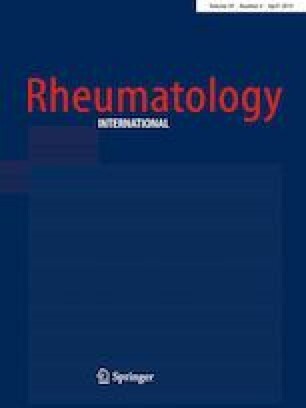 This study was presented as a poster in the Pan-American Congress of Rheumatology 2018 that took place in Buenos Aires, Argentina. The authors would like to thank Dr. Luis Catoggio for critical review of the manuscript. All the authors revised and approved the final version of this paper. The information encompassed in the database analyzed by the authors is anonymous and it identifies applications submitted between January 2012 and December 2016. Consequently, ethical consent was not obtained. This research has been authorized by the Local Office for People with Disability.